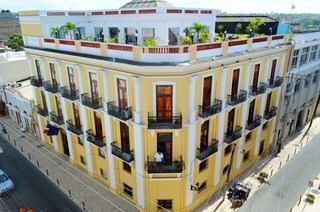 This hotel is located at the heart of Santo Domingo&apos;s old town. It sits at the crossing of Arzobispo Merino with Emiliano Tejera. The hotel lies just a short distance away from many sights and attractions. Guests will find themselves just a short distance away from Diego Columbus Castle, the Panteon Nacional, the oldest cathedral in the Americas, the Casas Reales Museum and the Calle El Condo. Las Americas International Airport is just a 30 minutes&apos; driving distance away. This traditional hotel enjoys an exquisite design, reflecting the typical architectural style of the colonial period. The guest rooms ooze charm and elegance. The hotel&apos;s facilities and services have been designed with guests&apos; individual needs in mind.